f you want to really change the world, Ray Ozzie has concluded, change the conversation. In this case, change it into a medium in which wireless speech becomes a durable, searchable part of the computer world. Mr. Ozzie, a well-regarded software engineer who in 2010 resigned as Microsoft’s chief software architect, on Tuesday announced a company and product called Talko. An app on the iPhone (and eventually Android phones and desktop computers), Talko enables one-on-one and group calls that can be recorded, tagged, amended and augmented with photos, all while the call is going on. Later, parts of it can be searched for important elements, such as when a project is due. Talko enables one-on-one and group calls that can be recorded, tagged, amended and augmented with photos, all while the call is going on. That is to say, conversations would be marked and made durable, something that has been long been sought by adherents of something called “hypervoice.” Talko does this by some clever software inside the cloud computing systems of Amazon Web Services and Microsoft Azure, a global computing system that Mr. Ozzie helped create while at Microsoft. It does so with an elegant design that allows users to turn down calls or text seeking permissions, or leave one another short voice messages that are more like audio texts than voice mail. 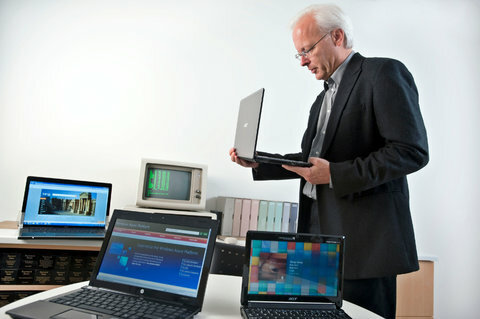 During a call, Talko shows images of all participants. The talker takes the center image on the phone’s screen, while others hover above. 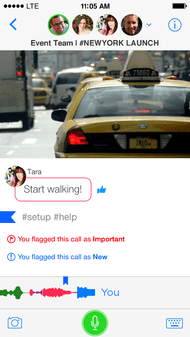 A running line across the bottom of the screen shows the call is being recorded, and also serves as a marker for insertions to the call like hashtags or photos. It is possible to take a picture during a call and post it so viewers can see the same thing. After the call, Talko creates a log that can show when it took place, who was in it, and what images and subjects were covered. All of this can be searched later, and is at the heart of Talko’s eventual business model. “In business, having old calls is critical,” said Mr. Ozzie, who founded Talko with Matt Pope and Eric Patey. While Talko is free to download and use, “we keep a 10-day rolling window of calls for businesses, and if they want to retain them longer we will charge.” He said he expected that service to cost $5 to $9 per user a month. As an initial product, Talko is impressive, but even Mr. Ozzie seems interested in what the implications might be of making voice into a durable object. While there has been some concern about the implicationsof such a move, it seems likely to happen. Perhaps it is particularly useful, then, that Mr. Ozzie has baked some privacy protection into Talko: Any participant in the call, he says, has the right to delete all or part of the conversation. “We wanted to make sure people know it’s in their hands,” Mr. Ozzie said. Of course, companies may not be bound by Talko’s protections, and could write around these policies; or another provider might come along with a similar service that does not have the delete protection. Early reviews, from a very small test group, were positive, however.